Gallery Renovations at the Lightner, and Stained Glass Collection Ready for Adoption! A photo of the former stained glass gallery before renovations began. Big Renovations are happening at the Lightner Museum, and what better place to start than the museum’s 2nd floor stained glass gallery. 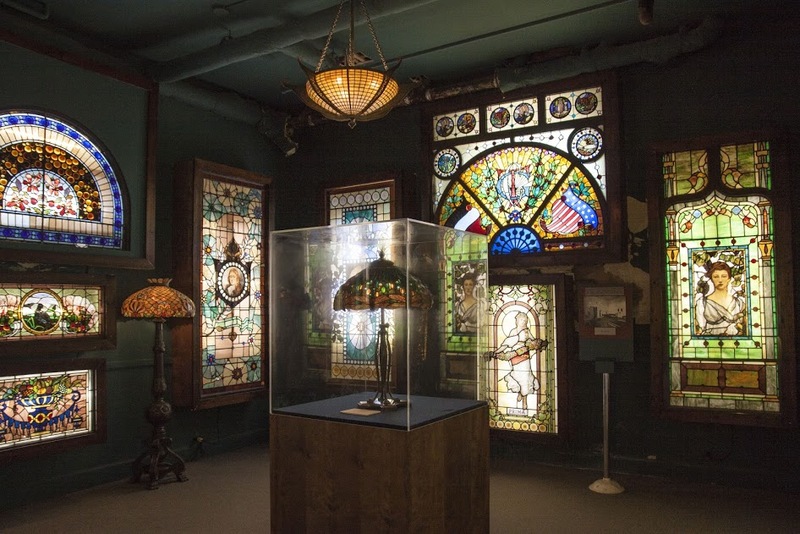 The stained glass gallery will be moving to the third level of the museum and the former Alcazar Hotel massage room on the second floor spa gallery will be turned into a new, state of the art space for the museum’s cut glass collection. Renovating these spaces allows the museum to improve its displays, and to exhibit items that have been patiently waiting to be taken out of storage. 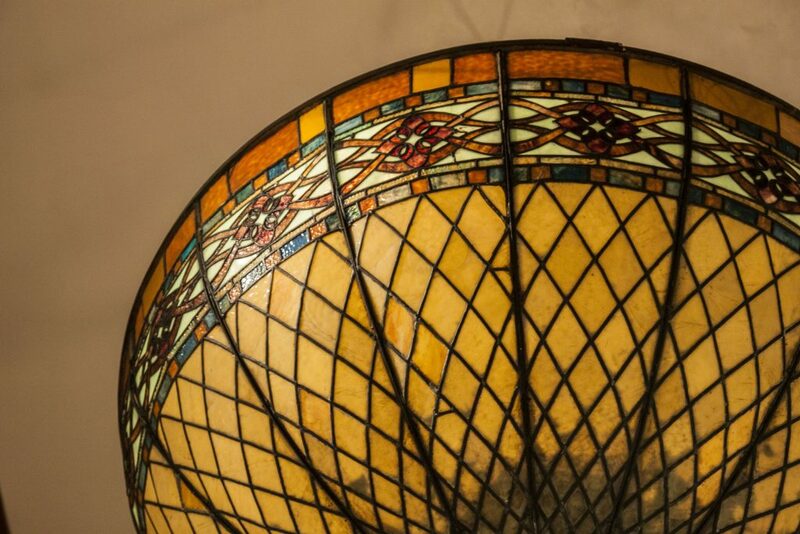 The Lightner is excited about these improvements, because it also provides the opportunity to list the stained glass collection as part of the museum’s Adopt an Artifact program. Adopt an Artifact allows donations to be made to the Lightner Museum that go directly towards the restoration of a specific item in the collection, which is typically selected by the Curator or the Director of the museum. RLA Conservation of Art & Architecture visited the Lightner and assisted in disassembling the stained glass room to get it ready to remodel. RLA also professionally assessed the museum’s stained glass collection in order to provide an accurate estimate of how much damage each piece has, and how much each item will cost to restore. The Flagler Museum in Palm Beach and the Cummer Museum in Jacksonville are just two of RLA’s select clients. There are 20 cracked panes of glass scattered throughout the window, but the most prominent cracks are around the woman’s mouth. There are dark lines in the cracks around the woman’s mouth, and testing will need to be done to see if they are removable. Overall the lead cames are in good condition. There are a couple of areas where the came is separating from the glass, and will have to be repaired. Cames are grooved strips of lead that join together pieces of glass in a stained glass window. To restore this stained glass window panel it must first be removed from the wooden frame that it is in. The panel is bowed, and should be placed on a flat surface to reduce the bowing. There are multiple pieces of lead came that are either bent, or separated from the pieces of glass that they should be holding together. The lead came in those places needs to be replaced or bent back to where it belongs. Some of the missing glass pieces have been found and just need to be put into where they belong, while other sections with missing glass need to be replaced. Many of the glass that is missing or broken is due to the bowing and bent lead cames. Finally, once all the glass and lead came is repaired, the wood frame around the entire panel needs to be replaced. 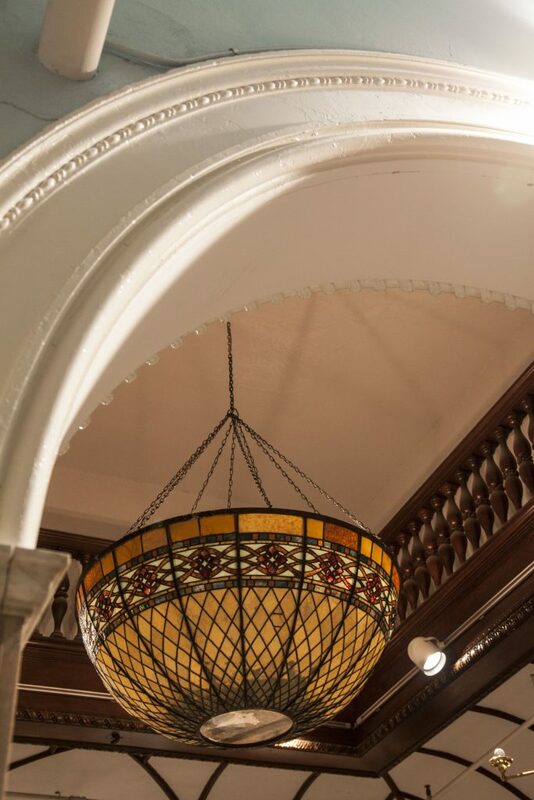 This leaded glass dome has been converted to a chandelier and is hanging on the second floor of the museum. 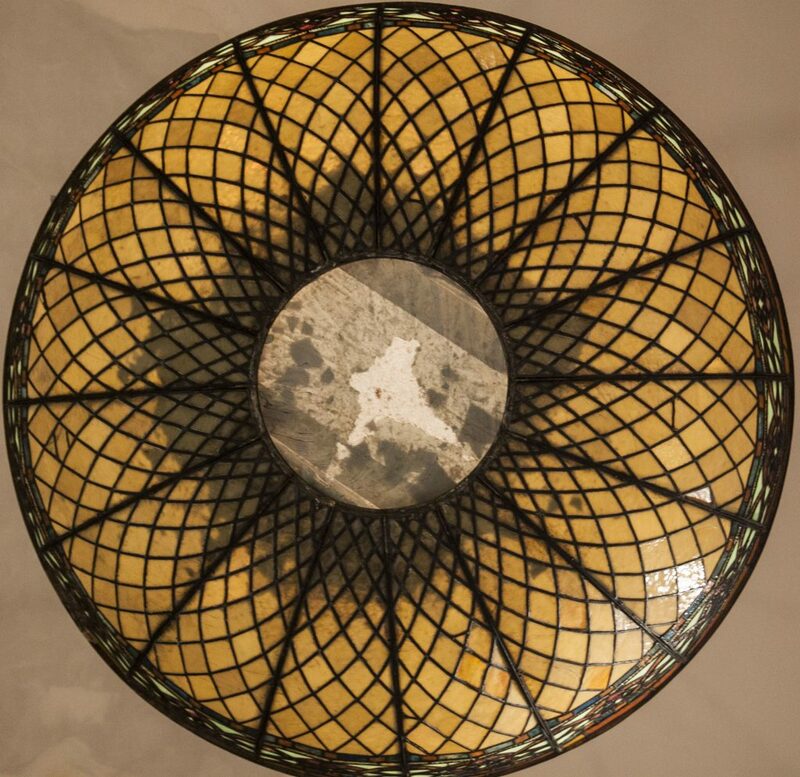 The museum plans to place it back in its proper orientation, but moving the dome will require help from art handlers. The dome needs to be professionally cleaned, and a conservation grade adhesive will need to be applied to any cracked pieces of glass. Adding a clear protective barrier to the lead cames and metal structural supports may be necessary. The Lightner Museum is a non-profit cultural institution sustained by the generous support of individuals, businesses, and sponsors.